To use humane animal husbandry practices. To produce chemical, hormone and antibiotic free offerings. To operate as sustainable as possible. To work with other local farmers that operate by the same values and ethics as we do. To use local butchers and other local companies whenever possible. To provide old-fashioned and personalized customer service. Maple Bay Farm is a family-run operation with three generations now living on the land. It all started in 1946 with Margaret and George Whittaker’s, my grandparents, decision to purchase 350 acres on Herd Rd. here in Maple Bay, just minutes from Duncan, BC. My grandmother went on to develop a highly successful dairy farm while my grandfather ran his own select-logging company. Both were well known in the Cowichan Valley and together raised 6 children. Years later, and after the passing of my grandmother, my mom, Beverley (Whittaker) Humphreys one of Margaret & George's three daughters, along with my dad, Bob Humphreys, offered my family and me the opportunity to move back to Maple Bay Farm to assist them in keeping the farm in the family. My wife, Jeannette, our two children and I, gladly accepted their invitation to return to the farm and together with my mom and dad, began the task of rebuilding the structures. The quota was long gone so the decision was made to raise beef cattle and sell hay. In addition, my sister Megan has built a house and joined us in our farming venture by raising chickens and a few sheep. Over the past eight years we have begun to develop a loyal customer base. Maple Bay Farm's hay is a favourite with horse lovers who are looking for quality without breaking the bank. We also introduced unique storage solutions for those customers who don't have the facilities to house the hay they need (visit our Contact Us page for details). From the very beginning, Margaret was dedicated to the humane treatment of her animals and to never using pesticide or herbicide sprays of any kind on the orchard or fields leaving us a solid foundation to build on. We take tremendous pride in our heritage, continue to honour her commitment to all-natural farming practices, and invite you to visit us here on Maple Bay Farm today. 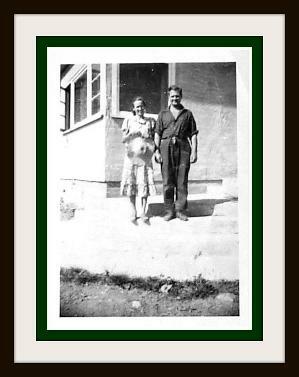 Margaret and George Whittaker in 1952 standing on the front steps of their newly built home on Maple Bay Farm. We appreciate your support and thank you for taking the time to like and follow us on Facebook and Instagram.